Effect of laser power on cutting quality. The process of laser cutting is the process of absorbing light energy and turning it into heat energy and making the material melt and vaporize. The laser beam with high energy density output by laser generator. The beam is focused through the focusing lens and the energy is highly concentrated. 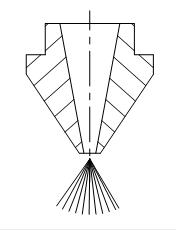 The focused beam passes through the center of the nozzle, and the nozzle ejects out auxiliary cutting gas which axis is same as the light path. Under the joint action of the laser beam and cutting gas, the cutting material is rapidly heated, oxidized and evaporated to achieve the cutting purpose. The basic principle of laser cutting is the interaction between laser and matter. It contains both the complex microscopic quantum processes and the macroscopic phenomena of the laser acting on various media materials. These macroscopic phenomena include the absorption, reflection, refraction, energy conversion and transmission of the material to the laser, the material status and ambient gas composition, the tissue effect of a light beam on a material surface etc. Therefore, the factors that affect the quality of laser cutting are very complicated. In addition to the processing material itself, it is mainly light beam characteristics, laser power, cutting speed, nozzle type (aperture) and nozzle height, focus position, auxiliary gas type and pressure, etc. 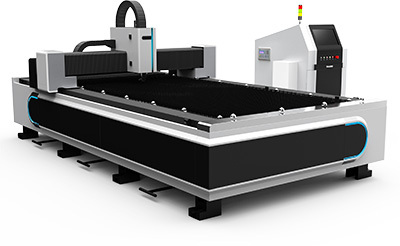 The width of laser cutting is closely associated with the beam mode and the focal spot diameter. Since the power density and energy density of laser irradiation is related to the diameter of the laser spot, the diameter of the spot should be as small as possible in laser cutting in order to obtain greater power density and energy density. The size of the spot diameter depends on the diameter of the laser beam output by the oscillator and its divergence angle. It is also related to the focal length of the focusing lens. It can be seen from the above equation that if the laser beam itself has a smaller divergence angle, the diameter of the spot will also be smaller, thus achieving a good cutting effect. Reducing lens focal length ƒ is beneficial to reducing spot diameter. However, if ƒ is reduced, the focal depth will be shortened, it is not conducive to obtaining the equal width of the incision on both the upper and lower section for the cutting of thicker plates, which will affect the quality of the slit. At the same time, the distance between the lens and the workpiece is reduced if reducing ƒ. 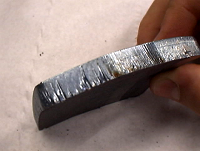 When cutting, the slag will splash on the surface of the lens, which will affect the normal operation of the cutting and the service life of the lens. The focal length of the lens is small, the power density of the beam is high, but the focal depth is limited. It is suitable for high – speed cutting of thin plate, just ensure that the spacing of lens and workpiece is constant. 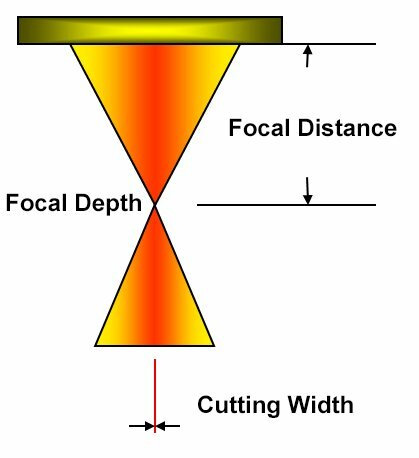 The long focal lens has low power density, but it has large focal depth and can be used to cut thick sections of material. The shorter the focal length, the smaller the focal spot; the longer the focal length, the larger the focal spot. This is also applied to focal depth changes. When the lens focal length increases to double the focal spot size, i.e. from Y to 2Y, the focal depth can be increased to four times, i.e. from X to 4X. The beam pattern is related to its focusing ability, which is somewhat similar to the sharp edge of the mechanical tool. The lowest order mode is TEM00, and the energy in the spot presented gaussian-like distribution. It can almost focus the beam on the theoretical smallest size, such as a few micron diameters, and form a pointed high energy density. The laser mode is as shown in the fig. The energy distribution of high-order or multi-mode beam is more expansive. The focused light spot is larger and the energy density is lower. Using it to cut material is like cutting with a blunt knife. The lower the mode of the beam, the smaller the spot size, the greater the power density and the energy density, the better the cutting performance. In the cutting of low carbon steel, the cutting speed of the base mode TEM00 is 10% higher than that of the TEM01 mode, and the roughness Rz produced by it is lower by 10μm. In the best cutting parameters, the roughness Rz of the cutting surface is only 0.8μm. 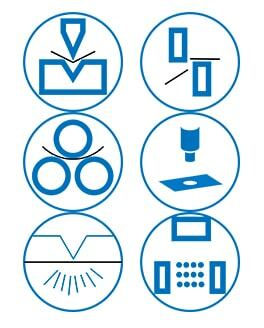 Therefore, in the laser cutting of metal materials, the laser of TEM00 mode is generally used to obtain higher cutting speed and better cutting quality. 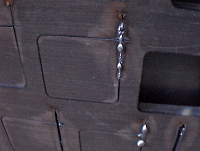 The size of the laser power directly affects the thickness of the steel plate that can be cut. The higher the energy, the thicker the cutting material. In addition, it affects the dimension precision of the workpiece, the width of the cutting, the roughness of the cutting surface and the width of the heat affected zone. Laser power density P0（W/cm2） and energy density E0(J/cm2) illuminated on the workpiece in laser cutting process have an important influence on laser cutting process. With the increase of laser power density, the roughness decreases. When the power density P0 reaches a certain value (about 3×106W/cm2), the roughness Rz value no longer decreases. The larger the laser power, the thicker the material that can be cut. But for the same power laser, the thickness that can be cut will be different for different materials. 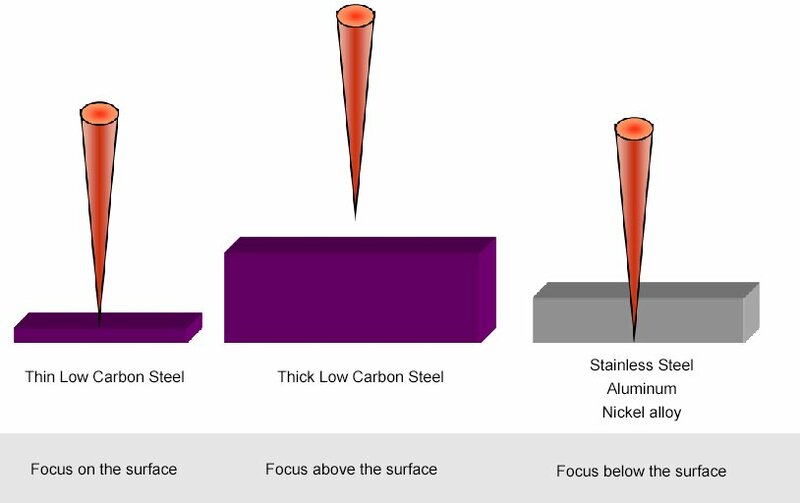 Table 1 shows the maximum thickness for CO2 laser cutting of various power of some metal materials. For laser generator with continuous wave output, the laser power size and mode will have an important influence on the cutting quality. In practice, the maximum power is often set to obtain the fastest cutting speed, to improve the production efficiency, or to cut the thicker material. In theory, the larger the output, the better. But considering the cost of the laser generator, the output power of the laser generator should only be set close to the maximum output power of the cutting machine. The cutting speed has great influence on the cutting quality of stainless steel plate. 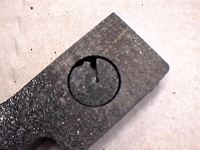 The best cutting speed makes the cutting surface smooth and the bottom is free of slag. If the cutting speed is too fast, it will cause the steel plate to be unable to cut through, causing the sparks to splash and the lower half to produce slag and even burn the lens. 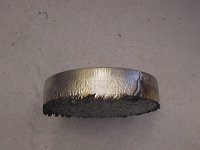 This is because the cutting speed is too high, the energy per unit area is reduced and the metal is not completely melted. If the cutting speed is too slow, it is easy to cause the material to melt, the cutting seam becomes wider, the thermal influence area increases, and even the workpiece is burnt. This is because the cutting speed is too low, the energy accumulates at the cutting edge, causes the slit to widen, the molten metal cannot be discharged in time, and the lower surface of the steel plate is formed with slag. 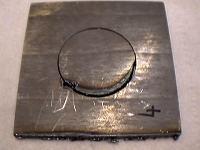 It produces the cutting defect as shown in figure 4. The cutting speed and the laser output power determine the input heat of the workpiece. Therefore, the relationship between input heat change and processing quality caused by the increase and decrease of cutting speed is the same as that of output power. In general, when the processing conditions are adjusted, the output power and cutting speed will not be changed at the same time if the input heat is changed. Just to fix one side and change the other side to adjust the processing quality. The nozzle shape (aperture), nozzle height (the distance between the nozzle outlet and the surface of the workpiece) can affect the cutting effect. Control the gas diffusion area to control the cutting quality. The coaxial degree of nozzle outlet hole center and the laser beam is one of the important factors influencing the quality of cutting. The thicker the workpiece, the greater the impact. When the nozzles are deformed or melt, the coaxiality will be directly affected. The nozzle shape and dimension precision requirements are high, so the nozzle should be carefully preserved, avoid the collision to avoid deformation. If the conditions of the cutting are changed due to the poor condition of the nozzle, it is better to replace the new nozzle. 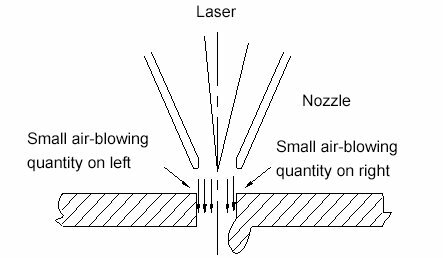 As shown in the figure, when the auxiliary gas is blown out from the nozzle, the air quantity is not uniform, and there is a melt on one side and no on the other. 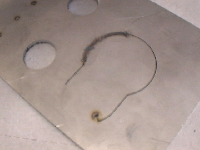 It has less influence on the cutting of the thin plate under 3mm. When cutting more than 3mm, the influence is more serious, sometimes cannot be cut through. If the workpiece has a sharp angle or small angle, it is easy to generate over-melting and the thick plate may not be cut. The perforation is unstable, time is not easy to control, and the thick plate will cause the over-melting, and the penetration condition is not easy to control. 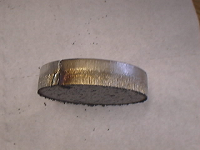 It has little effect on the thin plate. The focal position is the distance between the focal point and the surface of the workpiece based on the surface of the processed material. Above the workpiece surface is positive, below is negative. The focal position directly affects the width of incision, slope, cutting surface roughness and slag attachment. The focus position is different, the beam diameter and focal depth of the surface of the processed object are different. Then, the shape of the groove is changed, which affects the processing gas and the flow of molten metal in the processing ditch. Since the energy density is proportional to 4/πd2 (d is the focal spot diameter), d should be as small as possible in order to produce a narrow slit. At the same time, d is directly proportional to the focal length of the lens, and the smaller the focal depth, the smaller the d.
But the cutting has to spatter and the lens is too close to the workpiece to be easily damaged. Therefore, the focal length of 5″～7.5″（127～190 mm） is widely used in the industrial application of high power laser cutting, and the actual focal spot diameter is between 0.1 and 0.4mm. So it’s important to control the focal position. 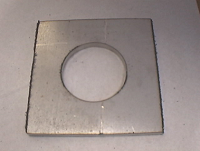 When cutting stainless steel plate, the focus position is generally below the surface. When the cutting thickness < 4 mm, choose 5″focus lens. The optical path length is different for cutting the proximal and distal ends with flight path cutting machine. There is a difference in the size of the beam before focusing. The larger the diameter of the incident beam, the smaller the focal spot. In order to reduce the change of focal spot size caused by the change of beam size before focusing, the optical path compensation system can be installed to keep the optical path of the proximal end and the far end unchanged. 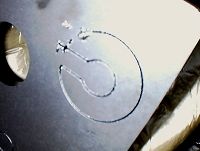 The laser beam passes through the focusing lens, as shown in figure 8. It can be seen from the above analysis that, in the absence of slag, the closer to the middle of the steel plate of the focal position, the smoother the cutting surface. The selection of focus position has an important influence on the cutting quality of stainless steel plate. 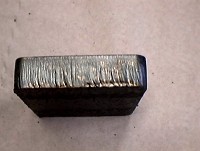 When the focal position is appropriate, the material that is cut is melted, and the material along the edge is not melted, then the slag is blown away, forming a non-stick cut seam, as shown in the figure (a) below. When the focus position lags, the amount of energy absorbed by the lower unit area of the cutting material decreases. The cutting energy weakens, causing the material to not completely melt and be blown away by the auxiliary gas. 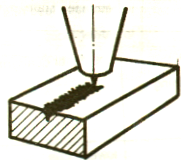 The material that has not completely melted is attached to the surface of the cutting plate, and it has a sharp and short slagging head, as shown in figure (b) below. When the focus position is advanced, the average energy absorbed by the lower unit area of the cutting material increases, which causes the material to be cut and material along the edge to melt and flow in liquid form. At this time, due to the constant pressure and cutting speed, the molten material is spherical and adhered to the surface of the material, as shown in figure (c) below. Therefore, the focus position can be adjusted by observing the slag shape during the cutting process to ensure the cutting quality. In actual production, the focus position is selected on the material surface or under the surface when cutting stainless steel plate with the laser cutter. This is because enlarging the upper width of the cutting groove to increase the fluidity of the gas and molten material and to enlarge the smooth surface area and improve the cutting quality. During the cutting process, the focal position does not have a certain value for the steel plates with different thickness. When the focus position is on the surface of the steel plate or above the surface, the energy is not enough and it is easy to produce slag on the lower surface due to the low average power density of the lower part of the steel plate. Therefore, when cutting stainless steel plate with the laser cutter, the focal position should be selected inside the material in order to increase the fluidity of gas and molten metal, ensure the lower part has enough energy density to enlarge the smooth surface area. The specific values are determined by experiments. Influence of auxiliary gas (type and pressure) on cutting quality. In general, the material cutting needs to use auxiliary gas, mainly involving the gas type and pressure. The gas type, air pressure, nozzle diameter and geometric structure influence the edge roughness and the generation of burrs. The gas consumption depends on the nozzle diameter and air pressure. When the cutting pressure is below 0.5MPa, it is low pressure, and above 2MPa is high pressure. Usually, the auxiliary gas and the laser beam are ejected coaxial, which can protect the focusing lens from being polluted while blowing away the bottom slag at the cutting zone. 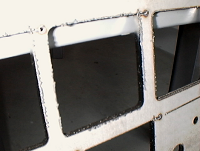 The types of gases used in general laser cutting are oxygen, nitrogen and air. Different cutting materials require different auxiliary gases. The oxygen is mainly used for tapping, high-speed cutting of carbon steel and stainless steel plate and oxidation cutting of highly reflective materials. 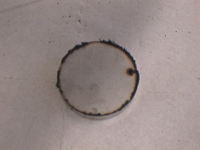 As an auxiliary gas, oxygen can also make metal to burn. The laser cutting machine uses its oxidation reaction heat for efficient cutting, but it also produces oxide film on the cutting surface. The air is mainly used for aluminum and galvanized steel plate cutting without slag and ordinary non-metal cutting. The auxiliary gas pressure varies with the type of gas used, cutting material, plate thickness and laser output form (CW/pulse). The auxiliary gas pressure affects the adhesion of slag, the quality of the cutting surface and the size of the heat affected area. Under the premise of determining the auxiliary gas type, the gas pressure size is an extremely important factor. If the auxiliary gas pressure is too high, the vortex will be formed on the surface of the workpiece to weaken the ability of the airflow to remove the molten material which causes the cutting surface rougher and the slit wider. If the auxiliary gas pressure is too low, the melting material of the incision is not blown and generate slag on the back of the cut material. Therefore, there is an optimum value for auxiliary gas pressure. When cutting thin materials at high speed, a high gas pressure is required to prevent the backside of the incision from producing slag. When the thickness of the material is increased or the cutting speed is slow, the gas pressure should be reduced appropriately. 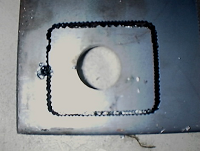 Taking laser cutting of stainless steel plate as an example, in the process of cutting, auxiliary gas can cool the adjacent areas of cutting seam to reduce the heat impact zone and prevent the burner from damaging the lens. 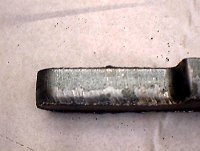 In addition, using nitrogen as an auxiliary gas, it can make molten metal have good fluidity. In actual machining, the cause of machining defects is complicated by improper process parameters. According to several decades of experience in laser cutting process, it is of great significance to summarize the countermeasures of cutting defects to guide the actual production. See appendix for details. The burr on the bottom is similar to the slag, which is in drip shape and easy to remove. Too fast feed speed Reduce feed speed. 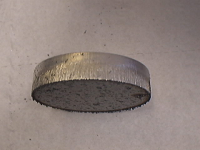 The metal burr can be removed as a block. The metal burrs on the bottom are difficult to remove. There is only a burr on one side. The nozzle has defects. Replace the nozzle. The material is expelled from above. The power is too low; Stop cutting immediately to prevent slashes from splashing into the focus lens. Then increase the power and reduce the feed rate. Two sides are good and two sides are bad for slope cutting. Blue plasma, not cut through the workpiece. Stop cutting immediately to prevent slag splashing into the focus lens. Processing gas error（N2） Use O2 as the processing gas. The cutting surface is not precise. The material is not good Use a smooth, homogeneous material. incision becomes narrower at the bottom. The feed rate is too high. Reduce feed rate. The feed rate is too low. Increase feed rate. 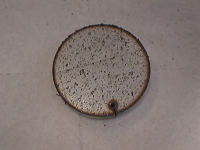 The surface of the plate is rusted. Use better quality materials. Produce a drip-like small regular burr. Both sides produce long irregular filamentous burrs, the surface discoloration of large plates. Long irregular burr on the cutting edge. The cutting edges are yellow. Nitrogen contains oxygen impurities. Use good nitrogen. Plasma is produced on a straight cross-section. The feed rate is too high. Stop cutting immediately to prevent slashes from splashing into the focus lens. The power is too low Reduce feed rate. The beam spread The feed rate is too high. Reduce feed rate. Plasma is generated around the corner. The angle tolerance is too high. Reduce the angle tolerance. Modulation is too high Reduce modulation or acceleration. The lens is dirty Clean the lens and replaces it if necessary. The power is too low Stop cutting immediately to prevent slashes from splashing into the focus lens. Air pressure is too high Reduce feed rate. Both sides produce long irregular filamentous burrs that are difficult to remove. Both sides produce long irregular burrs that can be removed by hand. The incision is rough The nozzle diameter is too large. Install the appropriate nozzle. The small regular burrs are difficult to remove. Plasma is produced on a straight cross-section. The feed rate is too high. Reduce feed rate. The focus is too low Raise the focus by 0.1-0.2 mm each time. The focus is too high Lower the focus, each time lower by 0.1-0.2mm. Cutting speed too fast Cutting speed reduces by 50-200 mm/min each time. The focus is too low The focus is increased by 0.1-0.2mm each time. Nitrogen is not pure Check the purity of nitrogen. There is oxygen or air in the air pipe. Increase the delay to clean the air pipe. The light path is not straight Check the light path and hit the target again. The introduction length of line or introduction is incorrect. Correct the introduction method and introduction length. The perforation time is too long. The perforation time is less than 2 seconds. There is too much heat in cutting. Reduce the duty cycle by 2-3% each time. Pressure is too high Reduce the pressure, 0.1 bar at a time. Power is too high Check the focus of the lens. Low power Increase the duty cycle by 5-10% each time. The pressure is too low Add power, 100W each time. Gradually increase the pressure, 0.1-0.2bar each time. Pressure is too high Reduce pressure by 0.1-0.2bar each time. The focus is too low Increase the focus, 0.1-0.2 mm per step. The pressure is too low Increase the pressure, 0.1-0.2 bar per step. And hope your sister also like this article.